Small in size but packed with mouth-sizzling heat, serrano peppers add a pungent spice and health benefits to your cooking. Used for medicinal purposes for ages, you will find serrano peppers in grocery and Mexican specialty food stores throughout the United States. They come in a shiny, bright green color and a slightly curved shape, resembling the more well-known and longer-in-length jalapeño peppers. You might want to try switching them out with other peppers in your recipes, as they not only punch up the flavor profile of your home-baked dishes, but they can combat prostate cancer, help keep your heart pumping strong, and aid in pain management. As a low-calorie, health-filled food, a serving of serrano peppers contains a mere 34 calories and 7 grams of carbohydrates. The majority of these complex carbs come from fiber, which controls your blood sugar and cholesterol levels. If you are trying to lower your fat intake, serrano peppers provide a minor .4 grams of fat per serving, composed mostly of healthy polyunsaturated fat. Serrano peppers do not contain much protein, only 1.8 grams per serving. To ensure a balanced diet, be sure to add healthy proteins to your meals such as salmon, legumes, lean meats and nuts. Serrano peppers provide a healthy dose of Vitamin A, which helps boost your immune system. Also, about 100 grams of serrano peppers provide approximately 75 percent of your vitamin C requirement (also necessary for keeping your immune system strong), 4 percent of your recommended daily iron and 5 percent of your recommended daily magnesium. Iron helps transport red blood cells for proper oxygen flow and magnesium is vital for proper muscle contraction. Antioxidants play a role in optimal body function and cellular response against daily stress. According to a study published in the Journal of Agricultural and Food Chemistry, fresh and processed serrano peppers provide positive antioxidant activity. If possible, you should choose fresh peppers for cooking, as they offer a higher level of antioxidants than processed ones. Capsaicin, the mouth-searing component of serrano peppers, was found to hinder prostate cancer cell growth in a 2006 study from the University of California Los Angeles and published in Cancer Research. Ingesting this ingredient triggered cell death in prostate cell lines of study participants; the researchers note this data suggests capsaicin might play a role in prostate cancer management. Capsaicin can also help lower your cholesterol by reducing its accumulation in your body and increasing its breakdown, according to research presented at a 2012 American Chemical Society meeting. Scientists reported that this heart-healthy food offers protection against the number one cause of death in the United States. In addition, capsaicin can block the movement of genes that makes arteries contract and restrict proper blood flow to the extremities. According to the Centers for Disease Control and Prevention (CDC), almost one out of three people in the United States will develop shingles at some point in their lives. Capsaicin can provide relief from the discomfort of shingles in low topical concentrations, as the compound provides pain reduction by acting on the impaired nerves that cause irritation after shingles, per a patient education review published in the Journal of Pain & Palliative Care Pharmacotherapy. How should I store serrano peppers? You should store these peppers in the refrigerator inside a sealed plastic bag (you can even put them between paper towels inside the plastic bag). This will keep them fresh for up to three weeks. To avoid getting the oils into your skin, handle the peppers with rubber gloves. Where can I purchase serrano peppers? 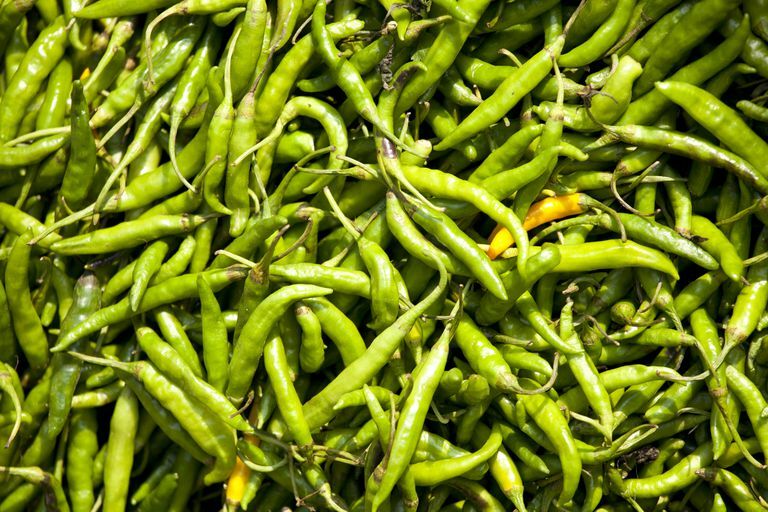 You can buy serrano peppers at most local grocery stores and Mexican specialty food stores. To choose the freshest ones, look for smooth, firm skin that does not have any moisture. How hot are serrano peppers relative to other peppers? Not everyone can handle the heat level provided by a serrano pepper's intense spice. To remove a bit of the fiery flavor, you actually should add more heat—in the form of temperature. Boiling or frying them can eliminate some of the scorching flavor, and removing the seeds can help with this as well. Using a sharp knife, you should cut out the seeds and membranes, which contain the majority of the capsaicin. If you do love spice, you can cook with every part (except the stem). In most recipes calling for jalapeños, you can substitute serrano peppers for an extra spicy kick. Allergies to spices affect 2 to 3 percent of the population, according to allergists at the American College of Allergy, Asthma and Immunology (ACAAI) Annual Scientific Meeting. The U.S. Food & Drug Administration does not regulate spices, and because of this, food such as peppers will often not show up on labels. This makes having a spice allergy one of the most challenging to deal with and identify. If you roast, fry, or boil them, you can reduce peppers’ allergy-causing agents. If you do have severe allergies, you should avoid spices altogether. Bacon K, et al. Antibacterial activity of jalapeño pepper (Capsicum annuum var. annuum) extract fractions against select foodborne pathogens. Food Sci Nutr. 2017 May; 5(3): 730–738. DOI: 10.1002/fsn3.453. Alvarez-Parrilla E, de la Rosa LA, Amarowicz R, Shahidi F. Antioxidant activity of fresh and processed Jalapeño and Serrano peppers. J Agric Food Chem. 2011 Jan 12;59(1):163-73. DOI: 10.1021/jf103434u.